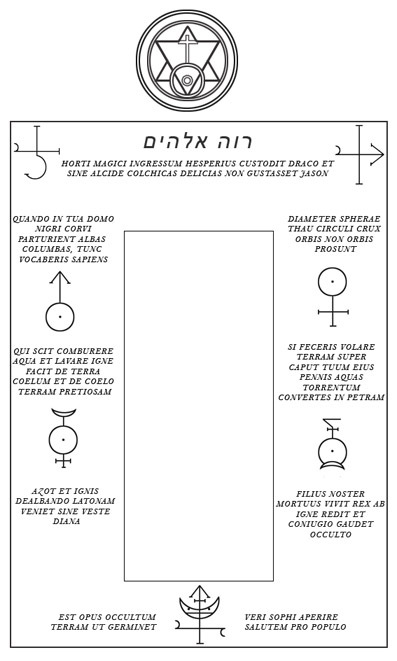 the 7 esoteric aspects which manifest in all experience and correspond to all other mystical symbolism regarding the one plus six. These mysterious messages are inscribed on the Porta Alchemica, a real physical location in Rome which I was lucky enough to visit. It is covered with alchemical secrets ! To every planet is associated a watertight maxim, to read from the bottom up to right in order to come down from above on the left, according the direction indicated from the Hebrew maxim "Ruach Elohim". then you will be called a sage"
are of no use to the blind"
and the sky into precious earth"
the streaming water into stone"
All the mottos refer to the achievement of alchemic knowledge, and to the need of being initiated in order to discern (otherwise "is of no use to the blind"). Some of them use highly symbolic allegories and figures of speech, such as the last two, whose meanings are: "as matter (Latona) will be purified by mercury and fire, silver (Diana) will reveal itself", and "by being born again from their own ashes (the dead son that lives, returning from fire as a phoenix), spirit and matter come together as one, as a result of an alchemic wedding, i.e. the coming together of a natural principle and its opposite (the conceiled mating)". so to make salvation germinate for the people"